Click the following category link to view similar titles: Trauma. 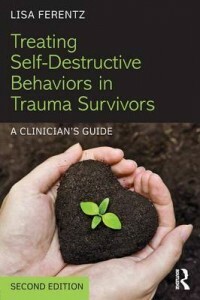 Treating Self-Destructive Behaviors in Trauma Survivors, 2nd ed, is a book for clinicians who specialize in helping trauma survivors and, during the course of treatment, find themselves unexpectedly confronted with client disclosures of self-destructive behaviors, including self-mutilation and other manifestations of deliberately “hurting the body” such as bingeing, purging, starving, substance abuse and other addictive behaviors. Arguing that standard safety contracts are not effective, renowned clinician Lisa Ferentz introduces viable treatment alternatives, assessment tools, and new ways of understanding self-destructive behavior using a strengths-based approach that distinguishes between the “experimental” non-suicidal self-injury (NSSI) that some teenagers occasionally engage in and the self-destructive behaviors that are repetitive and chronic. In the new edition, many of the treatment strategies are cross referenced to a useful workbook, giving therapists and clients concrete ways to integrate theory into practice. In addition, Ferentz emphasizes the importance of assessing for and strengthening clients’ self-compassion, and explains how nurturing this idea cognitively, emotionally, and somatically can become the catalyst for motivation and change. The book also explores a cycle of behavior that clinicians can personalize and use as a template for treatment. In its final sections, the book focuses on counter-transferential responses and the different ways in which therapists can work with self-destructive behaviors and avoid vicarious traumatization by adopting tools and strategies for self-care. Treating Self-Destructive Behaviors in Trauma Survivors, 2nd ed, can be used on its own or in conjunction with the accompanying client-focused workbook, Letting Go of Self-Destructive Behaviors: A Workbook of Hope and Healing.